MANILA, Philippines – Gilas Awaken! Suffering from its first and tormenting loss of the tournament against the lower-ranked and mystery team Palestine, Coach Tab Baldwin and his boys have bounced back heavily as they beat Hong Kong, 101-50, on Thursday, September 24, In Changsa – Hunan, China. Hong Kong came in very high spirit as they dismantled team Kuwait yesterday, 87-50 while Philippines tried to atone its humiliating loss against the unheralded Palestinians. Jason Castro posted the first 2 points of the game off a steal followed by Andray Blatche’s ring less trey in front of Hong Kong’s main man Duncan Reid. Dondon Hontiveros who was shooting blanks yesterday set his scoring tone with a mid-range jumper. Ranidel de Ocampo gave his fair share seconded by “The Blur” at the right corner for a 12-0 run. Hong Kong had to call a time out to iron things out and decipher how to counter Philippines’ scoring aggression. Cheng finally placed his team on board with an assist from Duncan Reid but Hontiveros was quick to counter it with a three-pointer. Terrence Romeo replaced Jason Castro at the point guard position and immediately drained a long bomb for a 20-2 lead. After scoring a bunch from down town, Philippines fell in love with it and gave window of opportunity for Hong Kong off transition and cut the lead down to just 12 from as high as 18 under a minute in the 1st quarter. Hong Kong scored one more trey as they closed quarter number 1, 28-15. Wong who made the last basket in the first, started the next chapter with another three point shot to trim the lead to just 10. Coach Baldwin had no choice but to put back Blatche in for additional muscle in the front court. The 6’11” Naturalized Filipino quickly fired from the outside to announce his re-entry. Gilas tallied its first 20-point lead of the game with Matt Ganuelas-Rosser dished a dime to his Talk ‘N Text team mate Jason Castro, 41-20. Dondon Hontiveros made a back-to-back trey while Hong Kong continued to miss from long distance. After 20 minutes of action Gilas headed onto the dugout with a 51-22 lead. Andray Blatche committed 2 straight personal fouls against Duncan Reid. 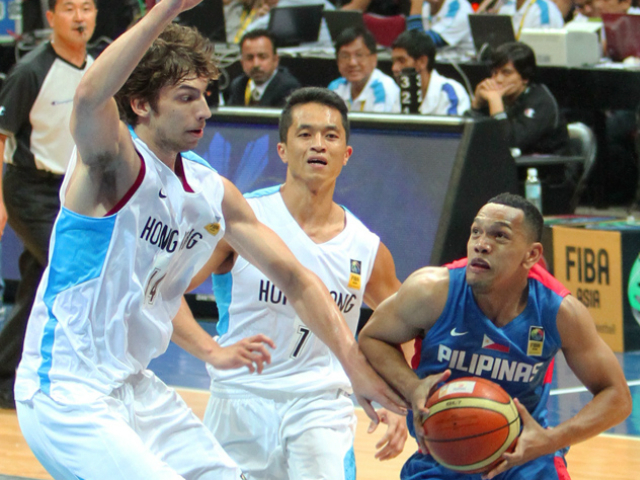 Reid split his charities and Gilas maintained its 52-22 lead early in the 3rd quarter. Blatche returned the favor on Reid as the latter consumed his 3rd foul on his rival. Ranidel de Ocampo provided more spark for Team Pilipinas with a contested one-handed jam assisted by Gabe Norwood. Jason Castro was really unstoppable on the floor and really waxing hot from the outside. Castro buried 2 successive threes to increase Gilas’ 75-31 lead. In contrast, Hong Kong kept shooting blanks from the rainbow territory. Terrence Romeo who was quiet this game shut the penultimate quarter by sinking his 2 foul shots. Gilas was up, 83-38 heading to the final quarter. Bad luck was on Hong Kong’s side. Not only their long shots were missing, even their close-ranged and spot on shots were all widely missing. Gilas Pilipinas hit the 100th mark courtesy of JC Intal, 101-50. Philippines will improve its standing to 1-1.